The European Union has never been a unity but recent conflicts even sharpened the divisions. We have not only the broad EU-28 but the euro-zone within it and the Schengen-area as a next dimension. Moreover, the continent falls into the rich and stable North and poor and indebted South on the one hand, as well as the multiethnic and open West and the monoethnic and closed East on the other. Since no state wants to be excluded from the elite, European politicians started to blackmail each other using the threat of exclusion rather than cooperate. If the EU fails and loses to eurosceptic governments that may come to power due to the unwise decisions taken by the Community, then the current leaders will be to blame. It started a few years ago with the Greek debt crisis and the possible expulsion of the country from the euro area. It was a forcible way of making Greece carry out reforms in the manner intended by the Troika, even if the Greeks had their own views. And blackmailing still continues, as only if the next deadline of a bail-out comes. Greece, the black sheep of the EU, has been recently forced also to succumb to the EU pressure in terms of the migration crisis1. Rejecting the ‘help’ from the EU could lead to being barred from the Schengen Agreement for up to two years, though officially such an issue was never considered2. Under pressure, the Greek government accepted the help with the migrant registration, reinforcing border guards and received some supplies such as tents and generators, acquiescing once again in the interference from outside. 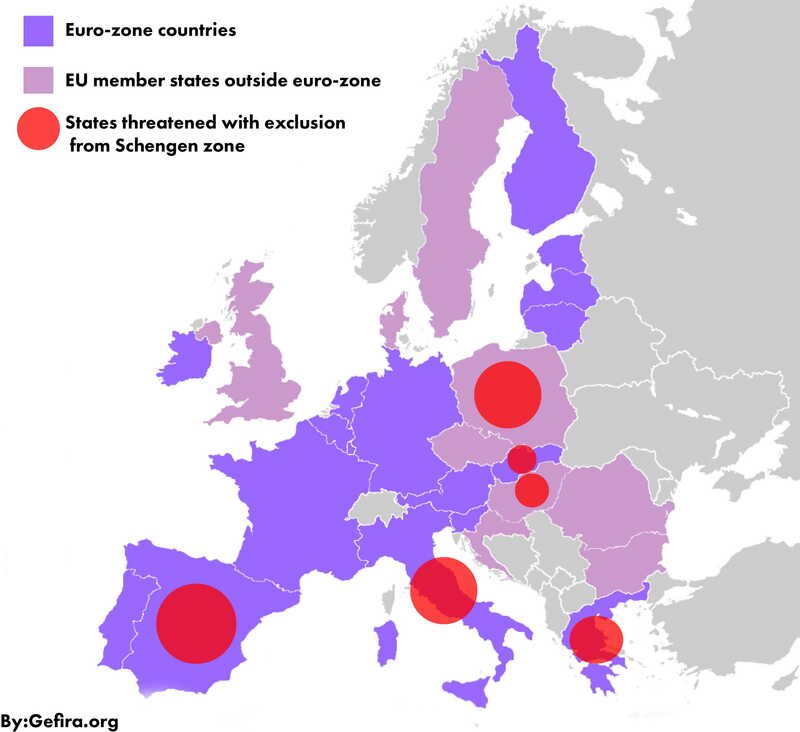 As blackmailing has become a political tool to influence internal decisions, eastern and southern EU countries are running a risk of being excluded from the Schengen Area as well. It concerns not only Greece, Spain, Italy and Hungary, which are transit-states for migrants, but also Poland and Slovakia, whose borders are not a threat to European security. ‘Mini-Schengen’ could be limited to as few member states as Sweden, Germany, Austria, Belgium and the Netherlands3. Such a proposal from Eurogroup chief Jeroen Dijsselbloem is a clear message for unruly countries: do not argue, otherwise you will pay. The Visegrad-countries (the Czech Republic, Hungary, Poland and Slovakia) have firmly rejected the ‘Mini-Schengen’ idea, establishing the ‘Friends of Schengen’ group4. V4, one of the leading sides against imposing compulsory quotas for asylum-seekers, demanded also that the EU funds not be made dependent on the debate on migration, which has become another tool of pressure from Germany5. Obviously, the main foe of the EU within its borders is Hungary’s Viktor Orban, who may face sanctions over alleged breaches of EU fundamental values6 (even if most of politicians copy his solutions). Now, it is not surprising that the Danish people, having always had a laid-back attitude to the EU, voted No over joining EU justice and home affairs policies7. Like Britons, they are lucky to have opt-outs because without such a privilege, they could also experience this EU policy-making mechanism that has developed recently: if you have another point of view, think it over because you are at the mercy of the infallible EU commissars. Once, the European Union was a group of countries with common interests, searching for best solutions, worked out by politicians, whose thoughts were far-sighted enough. Now, when there is no political leadership but blurred political accountability based on endless and needless summits, when breaking the self-imposed rules has become a new principle, all countries treat the European Union as a tool of their own short-term interests.